Some sixty-six million years ago, a scene of unimaginable horror played out in a North Dakota floodplain now aptly known as the Hell Creek Formation. It came without warning; Earth shook violently with the seismic waves originating from an impact equal to a magnitude 10 or 11 earthquake, and deadly glass beads rained down from the sky like tiny ballistic missiles traveling 200 miles per hour. But for Cretaceous life in Hell Creek, it would be the waves that proved most devastating. Through six years of digs at the site, a paleontologist has finally confirmed something he's long suspected – in the heart of North Dakota lies a prehistoric ‘killing field’ that may be the best evidence yet of the events that occurred during Earth’s most notorious mass extinction. Fossilized fish, vegetation, mammals, insects, marine reptiles, and even part of a Triceratops lay piled atop one another, preserving for eternity the moment a 30-foot wall of water pummeled the landscape and buried all living creatures in its path. 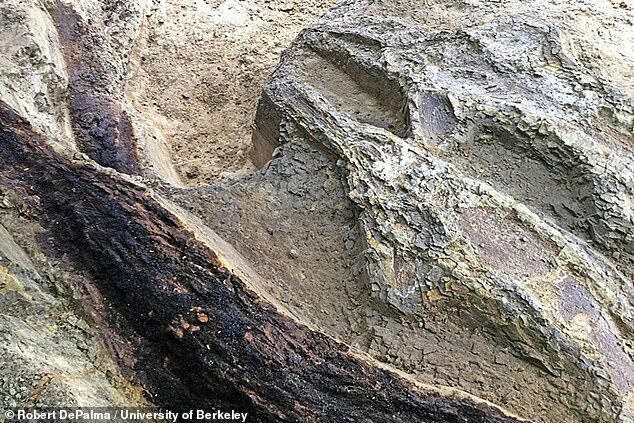 According to paleontologist Robert DePalma, it’s the first ‘mass death assemblage’ of large lifeforms that’s ever been found from the dinosaur extinction event. It’s not just another cache of Cretaceous fossils – the scene discovered at what's now known as the Tanis outcrop may well be the Holy Grail. ‘At no other K-T boundary section [end of the Cretaceous Period] on Earth can you find such a collection consisting of a large number of species representing different ages of organisms and different stages of life, all of which died at the same time, on the same day,’ a said DePalma, curator of paleontology at the Palm Beach Museum of Natural History in Florida and a doctoral student at the University of Kansas. 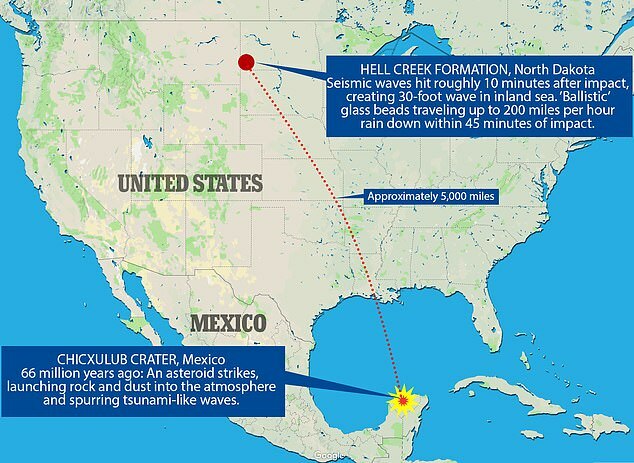 During the Cretaceous, the Hell Creek Formation was home to an inland sea that hosted all sorts of prehistoric life, from mosasaurs to snail-like cephalopods called ammonites. When the asteroid struck thousands of miles way, it birthed a tsunami-like wave that temporarily reversed the flow of a nearby river and tossed hundreds, even thousands of sturgeon and paddlefish onto land. 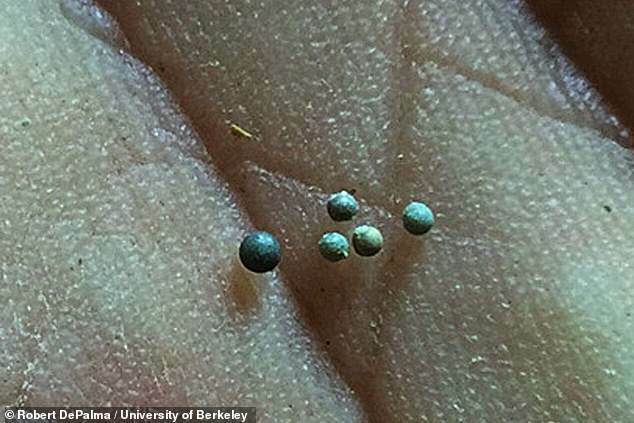 There, stranded on the sand bar, the fish were then pelted by high-speed glass beads called tektites that rained down from the sky as a product of rock melted during the impact. 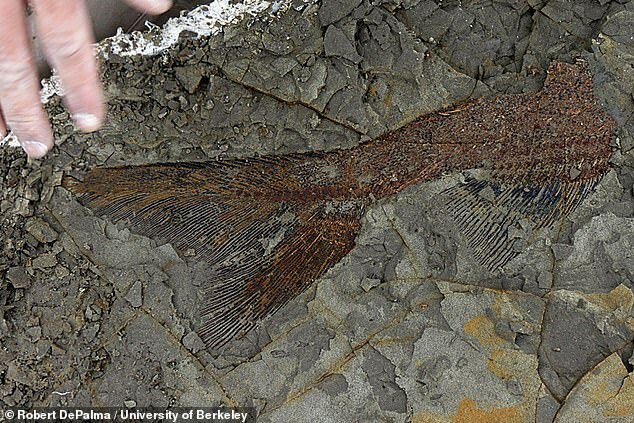 All of this can be seen in the fossilized deathbed at the Hell Creek Formation. 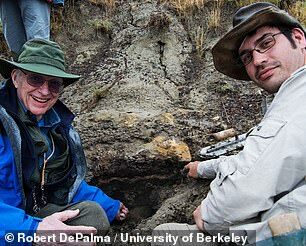 ‘It’s like a museum of the end of the Cretaceous in a layer a meter-and-a-half thick,’ said Mark Richards, a professor of earth and space sciences at the University of Washington. LIars and Frauds! No such thing as the chixulub freaking crater. LOOK! NOTHING THERE!!! Oh yea, you can see it if you have special infrared super spy glasses LOL! Now look at the "four corners" in the USA!